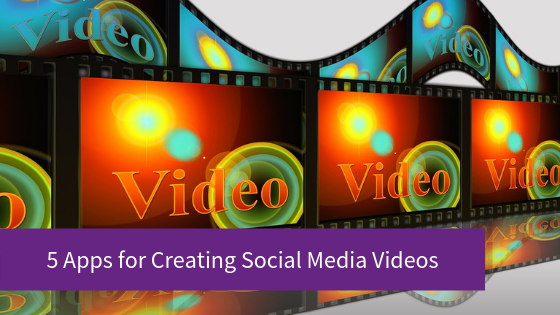 Video plays an important part in social media strategy. With video getting 59% more engagement than other post types and Mark Zuckerberg saying “video is critical for the future”, it’s well worth embracing video. However, not all entrepreneurs like to be in front of the camera and for this reason, many businesses are not using video. The good news is that video can still be used effectively, using images and text, without having to show your face. Here are five great apps for helping you create eye-catching short videos for your social media accounts. A great app for creating social media videos from your current content. Just upload your blog, text or longer form video and customise. Headliner is also ideal for creating podcast promos as you can upload your audio file (the app will import up to 10 mins) using their Audiogram Wizard. Once uploaded you can then choose the snippet of audio you want in your promo (and even get a transcription). The free option is great but you can upgrade for more options from $12.95/month. Ripl offers a wide variety of templates that you can customise with your brand colours, fonts and own photos. I like the ‘Daily Inspiration’ such a ‘Ideas’, ‘#Socialsaturday’ or ‘#WisdomWednesday’. Upgrade gives you options such as longer videos, more designs, own music and scheduling. The app is easy to use and you can create a video in minutes. Lumen5 is available on desktop for free or you can upgrade for more options, eg to remove Lumen branding. Start with a link or text, select your format and platform, then choose a style. Lumen will take select text from your blog and add it to a video scene. You can amend any text, add scenes and sub-scenes, highlight words and add music. Lumen cleverly selects video or photos that match your text. Sometimes that image doesn’t quite work so you can choose your own images or pick from stock. It sometimes takes a while to render your video and you can’t share directly from the desktop but overall I do love this app and use it a lot with my clients. Upgrade from $49.99 a month but there is so much you can do on the free account. Chant from Magisto focusses on social media marketing for business and is available on mobile. You can start from scratch or use one of their many templates under headings including ‘Increase Sales’, ‘Engage and Retain’, ‘Attract’ and ‘Awareness’. Each template allows you to customise text, style, colour, add a logo, and add extra scenes. The app makes it easy to share on your social media directly from the app. From £8.99 a month after a free 7-day trial. An easy to use app enabling you to create landscape or square videos. Animoto offers a wide variety of templates whether you want to tell a story, build an audience, promote a product or service. Or you can build from scratch. You can customise videos by uploading your own images or you can use their stock photos. Each video allows a change fonts and colours, and you can add more blocks (scenes) such as photo, text, quotes, videos. If you want you can add music too. Create on desktop and mobile, cost is from £7.99 a month otherwise your videos include a ‘trial’ watermark. With such easy-to-use cost effective apps, making videos for social media is accessible for every business owner. Comment below to let me know what you think of these apps, or if you love to use another social media video creating app.